Get into good habits to protect your teeth. Protein balls and granola bars have become popular snacks to stave off the mid-afternoon slump, but while they may be good for your energy levels, dried fruits like dates, apricots and raisins can be bad for your teeth. These high-sugar fruits are sticky so they adhere to your teeth, causing dental erosion, while fresh fruits, by comparison, are washed away by saliva. The advice here is to floss to remove any lingering remains followed by a glass of water. Pregnancy and contraception can affect your teeth and it's all down to hormones. During pregnancy, gingivitis, or inflamed gums, usually occurs in the second trimester and presents as swelling, bleeding gums. Switch to a toothbrush with softer bristles and tell your dentist about any gum soreness or bleeding you may be experiencing. As if morning sickness wasn't enough to contend with, it can also damage your teeth by coating the enamel in strong stomach acid. Avoid brushing your teeth after vomiting as it can scratch the enamel further. Instead rinse your mouth with water followed by a fluoride mouthwash. 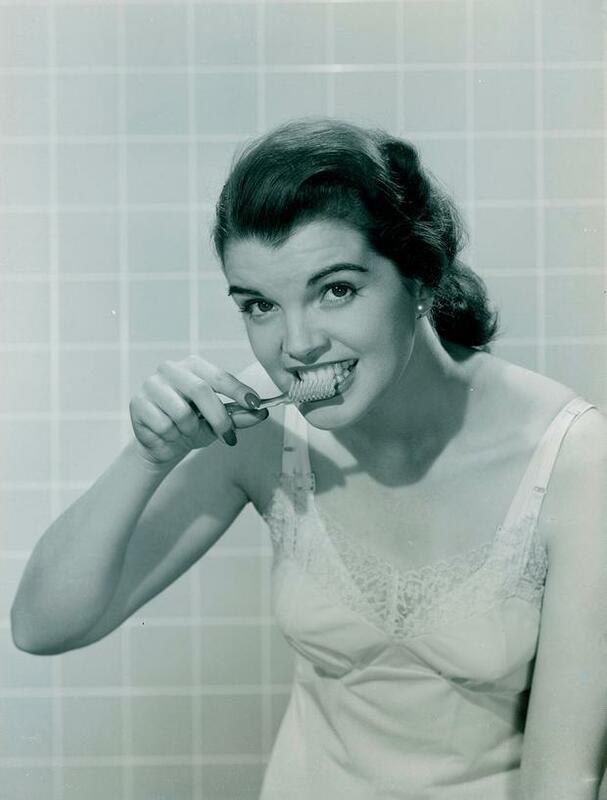 Wait at least 45 minutes before brushing your teeth. Hormones are also at play when it comes to how birth control affects your teeth as they can increase the levels of oestrogen and/or progesterone in the body. Studies have shown that pill users have deeper gum gaps and more severe bleeding. More worryingly, oral contraception users had much higher levels of bacteria in their mouth, and were twice as likely to have bone inflammation as women using other forms of birth control. Speak with your dentist about how to offset any potential damage caused by your birth control, and ask your doctor if a lower dose contraceptive pill is an option. Our humid bathrooms are a breeding ground for bacteria, and spray from a flushed toilet can reach up to six feet, coating our toothbrushes in a germ-rich mist. According to a study, the average toothbrush can contain up to 100m bacteria and while most are harmless, strains of E coli, staphylococci and the virus that causes hepatitis were found. This can introduce bacteria to open or bleeding gums which can lead to health problems. Close the toilet lid every time you flush to reduce bacteria spray and keep brushes in your bathroom cabinet or pop a cap over them. There is more to alcohol's effect on our teeth than simply red wine stains: heavy drinking causes higher levels of plaque on the teeth which can lead to periodontal gum disease and tooth loss. It can also cause dry mouth as it decreases the amount of saliva produced that washes away plaque and bacteria from the teeth and acts as a buffer against acid. Aside from alcohol, other ingredients in your gin and tonic can be harmful: citric acid in the slice of lemon or lime can erode tooth enamel leaving it susceptible to decay, as can chewing ice cubes. To avoid staining your teeth, sip darker drinks through a straw and rinse with water between each alcoholic beverage. Brushing should extend beyond just your teeth if you want better dental hygiene. Your tongue is a prime spot for bacteria as it can settle in the grooves and crevices and among the taste buds. This film of micro-organisms can cause bad breath as well as tooth damage and removing it takes more than just rinsing - you need to physically scrape it off. But be gentle as you don't want to break the skin: brush back and forth along the top and sides of the tongue and then rinse your mouth and brush with water. You can follow up with a mouth-wash. Tongue-scrapers are available in chemists but a toothbrush is equally as effective. Choosing the wrong kind of brush can wreak all kinds of havoc on your teeth. We wrongly assume that harder bristles will remove stubborn plaque but what they are actually doing is damaging the gums, weakening the root structure and scratching away at the protective layer of tooth enamel. Plaque is soft and comes away easily so a soft-bristled brush with rounded tips is the best option. Look for a brush with a small flexible head that can access those hard to reach areas. Taking a daily vitamin supplement is as natural nowadays as, well, brushing our teeth - but did you know they could be damaging our dental health? A study by the University of Helsinki on eight types of effervescent vitamins revealed that all of them had corrosive effects on teeth due to their primary ingredient, citric acid. By leaching out the minerals, teeth were left weaker and more porous and as a result more prone to decay. Fizzy vitamin C tablets were the worst offender, exposing dentine, the sensitive layer beneath enamel. To minimise the damage, don't swish the drink around your mouth and rinse with water afterwards. Nibbling on cheese can also help as it has an alkaline pH that can reduce acid levels and put minerals back into teeth. Avoid scrubbing your teeth. We are conditioned to think that harder is better in order to achieve that really clean feeling, when in fact over-enthusiastic brushing will simply wear away tooth enamel. Toothbrush abrasion can also damage the gums, pushing them back to expose the sensitive area which can lead to problems like periodontal gum disease as well as cavities. It is more important to be thorough than vigorous. It's late and the school lunches have yet to be made or it's late and you just want to hit the hay. We can be tempted to give our teeth a cursory swipe of a brush, a quick rinse, and out the door. Two minutes is the optimum time you should spend brushing your teeth and while a stopwatch in the bathroom may seem extreme, to get into the habit, check the time on your phone when you start and end and you will become accustomed to the correct time to spend brushing. Alternatively, turn on the nearest radio and brush along with a song from start to finish as most of them are between two and three minutes long. Back and forth, left to right: it's how we were all taught to brush our teeth. In fact, the correct way to clean is to work from the gum downward. Place the head of the toothbrush at a 45 degree angle at the gum-line and using circular up-and-down motions, gently stroke the teeth rather than 'sawing' them. Remember to brush around the gum-line where bacteria hides, pressing just hard enough that you feel the bristles. Grilling is definitely a healthier way of cooking meat but popular marinades are a double threat to teeth. Barbecue sauce is the main offender as it contains sugar which feeds the bacteria around our teeth, and acidic vinegar which damages the enamel. Skip the shop-bought sauces and make your own. Stir freshly chopped garlic, basil and rosemary into a little olive oil and smear on lamb or steak, or mix lemon juice, olive oil and chopped dill with a little honey and drizzle over fish or chicken. By making your own, you can control the amount of sugary or acidic ingredients you use. Brushing immediately after meals is a no-no when it comes to healthy teeth and gums. Acidic foods like citrus fruits - lemons, oranges, grapefruits - can weaken tooth enamel and brushing too soon after eating can damage it in this weakened state. Have a glass of water or rinse your mouth after eating these foods, leaving about 30 minutes before brushing. Another health fad that is surprisingly bad for teeth is juicing. Thanks to the wave of high-powered blenders, we are blitzing our favourite fruits to create drinks that are laden with sugar. A frozen banana adds an average of 12 grams of sugar to our favourite smoothies, which we then top with high-sugar yoghurt and a splash of nut milk that often contains sweeteners. Switch to vegetable juices and smoothies to care for your waistline as well as your teeth. Avocado makes an excellent base, add green tea instead of milk, and sweeten with carob or cocoa powder. Sip your juice through a straw and rinse with water afterwards to flush away any remnants.